That was an obvious late-hit call against Falcons CB Robert Alford. Totally unnecessary hit. #Packers say the injury is a foot injury for T.J. Lang. G TJ Lang has foot injury, return is questionable. Win, lose or blowout, #Packers WR Jordy Nelson has been impressive today. That's six catches, 67 yards, and a TD ... with broken ribs. Rodgers finds Nelson for a 3-yd TD reception. 2- point conversion is good. #Packers put together a 75-yard scoring drive capped by a TD pass to Jordy Nelson. It's 37-15 after the 2-point conversion. #Packers breaking out the onside kick in the third quarter, because they have no choice.
.@AaronRodgers12 finds @JordyRNelson for the TD! 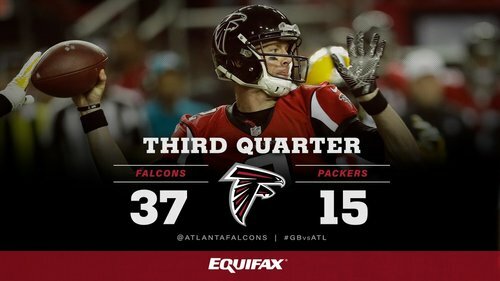 End of the third quarter: Falcons 37, Packers 15. Falcons are now 9-of-11 on third down against this #Packers defense. Incredible. 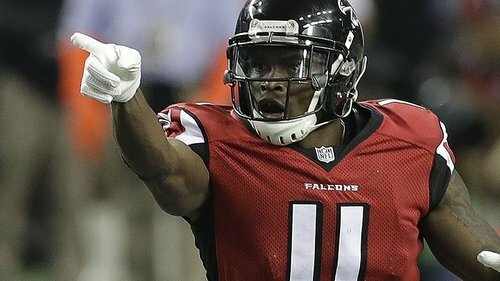 Falcons are now 10-of-12 on third down. #Packers defense has been noncompetitive. Coleman with a 3-yd TD run! The Falcons have scored 44 points in 48 minutes on #Packers defense. This is the same defense we saw in Tennessee, Washington. Toss left to Tevin Coleman for an easy touchdown. He turned the corner with speed and was not touched. It's 44-15 with 12:07 remaining. My god, it's 44-15. I could not have been more wrong today. #Packers have taken both Jordy Nelson and Davante Adams out of the game at this point. Cobb, Janis, Davis at WR. And now Nelson is on the field. And now Nelson just gingerly jogged off the field with #Packers in scoring position. Falcons are really gonna wish they hadn't burned timeouts. Sorry, @greta . Gave up 51 at Arizona in 2009 playoffs.